Once someone is used to commuting by bike, you won’t imagine how easy it is to forget how uncomfortable you felt riding your bike around the city the first time. While comfort and safe cycling practices come to feel like second nature, someone who hasn’t used a bike for a long time can feel uneasy. If they have never cycled on the road, it’s even worse. Getting on a bike and heading out on that first commute can be uncomfortable, scary, and even risky if you don’t know what you’re doing! Here, then, are our tips for your first commute! In a perfect world, we would have huge, interconnected networks of cycling lanes that would guarantee cyclists’ safety. A hybrid bike will protect you from many risks because these are more stable and easier to ride. Plus, they also have a longer life cycle than regular bikes on average. To learn more, read about the best hybrid bikes in 2018. If you haven’t been on a bike for some time, the first thing to do before riding around your city is simply get used with the bike. Get comfortable by practicing in your driveway, on a quiet side street, or in a park before you take the bike out on the road. Practice riding with one hand, shoulder checking, stopping quickly, and standing up to pedal among other motions you’ll have to do on your bike at one point. Make sure to check the bike before you take it out on the road. This includes putting air in the tires, cleaning the chain, and making sure the brakes are working properly. If you don’t understand much about how bikes work, take the bike to a local bike shop or co-op for a tune-up before you go – letting professionals take over is always a good idea. 4. Spatial Awareness is Important! We know all those spatially challenged cyclists out there and what a pain they can be. 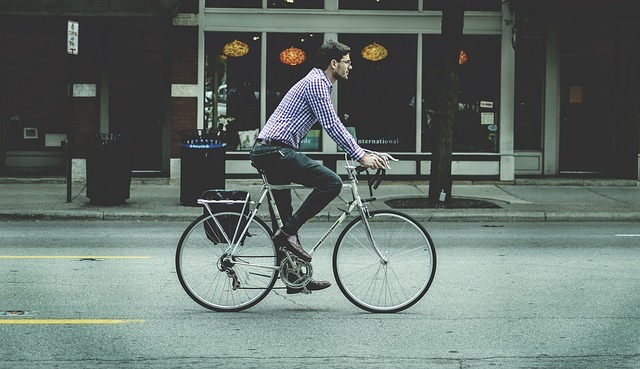 It is crucial to be aware of other cyclists, vehicles, and pedestrians around. Stop and wait for pedestrians at crosswalks, take notice of the turn signals of cars in front of you as you approach intersections, and shoulder check before turning. Pay special attention to staying out of the blind spots of motorists. Finding an experienced cycling buddy can be a great way to get ready for your first commute. Find a relative, friend, or coworker who cycles regularly, and join them on a trip around the city. Follow their lead. Focus on being and staying comfortable. Always overtake on the left, and use a bell to alert other cyclists and pedestrians as you pass. Look for a map of cycling lanes and paths in your community and devise a route to spend as much time in protected bike lanes as possible. It may be impossible to travel entirely in dedicated cycling infrastructure in your city, but lots of cities have cycling infrastructure that will make at least part of your trip safer.